Have you noticed a drop in your ads revenue? You are not alone, because ads block are now being Incorporated into browsers in order to help optimise browsing speed. Monetisation news has it that the entire advertising industry suffers from ads blocking. Site visitors install these ads block plugins in order to filter or block adverts to help save their mobile data. But worry not, you have invested a lot of resources in your site so you deserve to enjoy making money from your adverts. The truth is, ads blocking is on the rise and as such, you may continue to lose money. But in this article I am going to introduce you to some tactics to reduce ads block. In a polite way, ask your site visitors to disable ads block on their browsers, may be they might agree. Deny site visitors with ads block access to the website; do nothing and wait for changes. It is certain that you have heard about these ways or even tested them. But folks, I bet you found out how absolutely inefficient they are. AdBlock became a painful problem for publishers from the very beginning and time has come to lead up the ball. There are a whole lot of ads block bypass solutions out there but not all are working. Properllerads have developed an effective ads block bypass that has been tested working and okay. We are happy to present to you the most hard-line solution against AdBlock, providing an additional income for publishers – ANTI-AdBlock by PropellerAds. No magic. The solution’s scheme is quite simple. Nothing matters but the result will be sustainable – the ads are displayed to your audience. Always. Users don’t see your advertizing and publishers are still in lack of income. Your ads are shown to the users, bypassing AdBlock, but this is not the whole story. Besides, these users receive only specially adapted and tested advertising campaigns. These adblock-ready campaigns are not only displayed, but also personalized to adblock users and you gain additional revenue (up to 20%, depending on geo and platform) on such traffic! How to Integrate Anti-AdBlock and Increase profit? 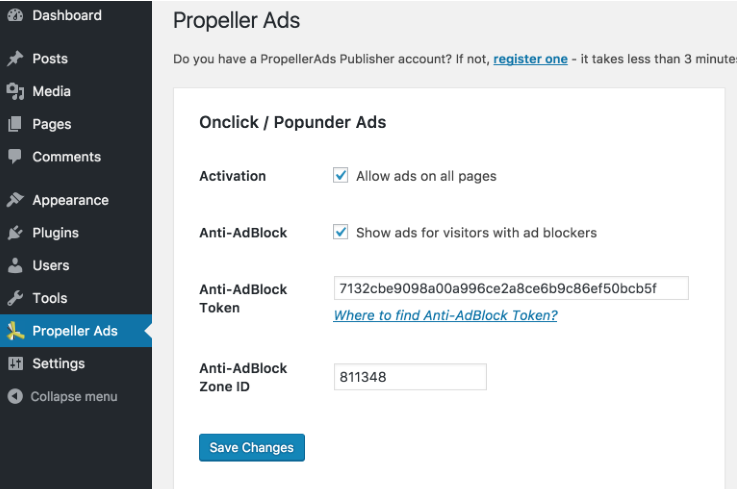 Currently, properllerads have launched Anti-Adblock solution for our flagship ad format – Onclick Ads (popunder). PHP code needs some development skills to implement it, but provides you unlimited anti-adblock support for an ad channel without having to replace the code regularly. If your hosting provider supports PHP, I strongly recommend that you use the PHP version of Anti-Adblock code. 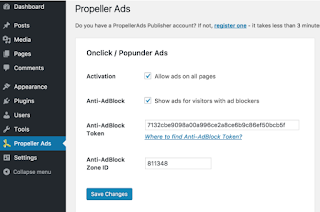 For all publishers who run websites on WordPress propellerads released its first version of official plugin that lets publishers easily integrate OnclickAds codes & enable Anti-Adblock support. Plugin can be downloaded from official WordPress repository. If you are experiencing any problems with integration Anti-Adblock codes – get in touch with me and I will be glad to help for just a token.